According to FirstShowing.net, Kurt Russell has been confirmed for Fast and Furious 7, and has already started shooting. Vin Diesel supplied the following photo on his Facebook page. It’s thought that he is playing the Father of Jesse, the ADD racer who was killed in F&F 1 (how foolish to take a Jetta up against an S2000!). He may also be connected to bad guy Jason Statham. 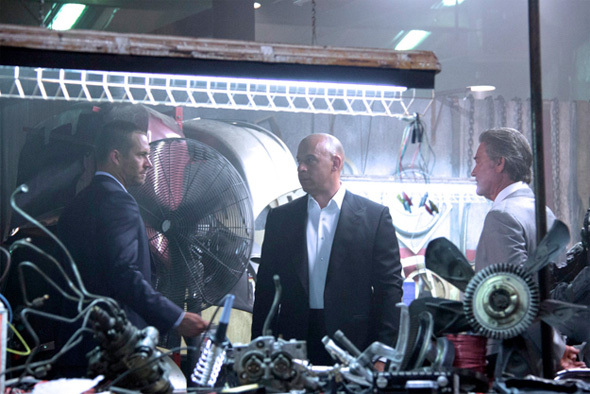 No word on what is happening in the photo… but we’re surprised to see Vin in a suit! And we’re wondering if Kurt is wearing tennis shows. Kurt has some history with car movies, including Used Cars and Deathproof… also (stretching now) 3000 Miles to Graceland and Escape from New York. Kurt has come a long way from his roots at Disney. Lucas Black is also returning for #7 (and more), and we’re glad to see that bit of news, too. It makes sense, since in the warped timeline of Fast and Furious, Part 6 actually took place before Part 3. Meanwhile, mark down July 11, 2014 for the premier of Fast and Furious 7. Yes, 2014, as these are now coming on a yearly basis. Be sure to see our special tribute to the Fast and Furious series, on our sister website CarMovieEnthusiast.com!